Millions of years ago, dinosaurs roamed the earth, and the mightiest was the Tyrannosaurus Rex. Click here to play! With a jaw taller than a man, and standing a good 10 to 12 feet tall, with a body as long as 30 feet, the T Rex was an apex predator that ranged even further than other dinosaurs of its kind. There really was no escaping the terrifying creature, as it was relentless in pursuit. 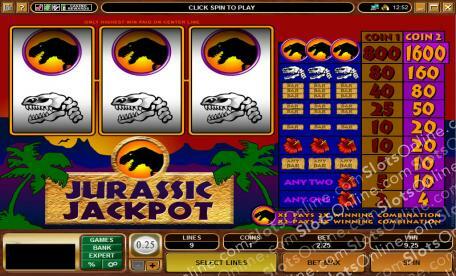 In the Jurassic Jackpot slots, you are trying to recreate this monster of the past from bones. Using your slots based dinosaur revivication equipment, you are looking to hit the Jurassic Jackpot by bringing a Tyrannosaurus Rex to life. On your way to hitting the Jurassic Jackpot, you could also bring to life ancient hibiscus flowers, but you may occasionally need to collect gold BAR symbols to fund this mad science project! Play the Jurassic Jackpot slots today and see if you can bring back the terrors of yesterday. The T Rex Silhouette symbol is wild, and it substitutes for any other symbol in these slots. Also, it acts as a prize multiplier, paying double the normal amount when 1 substitutes, and quadruple the normal amount when 2 wilds substitute.